Goodreads embodies one of my favorite ideas for a social network—a place to hang out on line and share books with friends and potential readers. They have a lot of nice tools to allow readers to interact with each other and for authors to interact with readers and share information about their projects. That said, the part I find the most challenging is site’s reliance on the five-star rating system. In particular, there are many books where I’m hard pressed to apply one “grade” to the entire book. Perhaps the book embodies beautiful prose, but has flat characters. Perhaps it’s a diamond in the rough that I thoroughly enjoyed despite some grammar and spelling problems. As with any social situation, I face awkward questions of going against the norm. What if I hated a book everyone loved or even loved a book everyone hated? I’ve finally decided the standard I’m going to use to give books ratings on Goodreads is simply my enjoyment of the book. If I had a good time or felt enriched from reading it, I’ll likely give it five stars. If the book tempted me to throw it across the room in frustration, I’ll likely give it one or two. This may seem an extremely simple approach and you may wonder why it too me so long to come to this conclusion, but it goes back to that whole awkward social interaction thing. It’s easy to get caught up in questions of what people think of your opinions. In this case, I’ve simply found a standard that allows me to explain why I’ve given a book a particular rating—and it’s a standard that’s fun for me. Of course another daunting element of all this is that I get to see what ratings people give my books. I do my best to adopt an attitude I first heard articulated by my friend Janni Lee Simner. I avoid trolling Goodreads for reviews and hope readers see it as a place where they can freely rate and discuss my books as they choose. I do look at the reviews from time to time and consider the comments good and bad, but I’ve also learned not to obsess over them. In fact, I’ve learned that most of my favorite authors have an average rating of about 3.5 give or take. Some readers love them, some hate them, a few are kind of neutral. This month, I’m giving away two of my books on Goodreads. 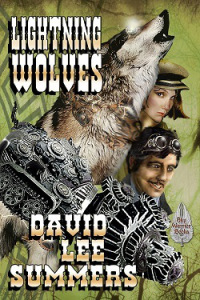 I’m giving away five copies of my wild west steampunk adventure novel Lightning Wolves at https://www.goodreads.com/giveaway/show/118409-lightning-wolves and I’m giving away five copies of my novel of vampire mercenaries, Dragon’s Fall at https://www.goodreads.com/giveaway/show/118410-dragon-s-fall-rise-of-the-scarlet-order. If you’re a Goodreads member, I hope you’ll enter to win! If you do win, I hope you’ll take time to review the book. Whether you liked it or hated it, a review shows you cared about the book and in the end, that’s what really matters. This entry was posted in Books and tagged dragon's fall, giveaway, Goodreads, Lightning Wolves, reviews, Steampunk, vampires. I normally give 5 stars because there’s rarely a book I don’t like. I finally read one though that was so horrible, I gave it a 3 thinking I was doing a good deed by not giving it a 1 but the author ‘got even.’ Now, if I read a book that I think is terrible, I won’t even rate it. On the other hand, when I had a bad or lackluster review, I like going and visiting some of my favorite “big name” authors on Goodreads. I’ve found that almost every author with more than a few hundred reviews has an average rating of about 3.5. It reminds me that even the best authors don’t please everyone and that even having many poor ratings don’t seem to hurt their sales. I think it’s all too easy to become fixated on any kind of “numbers,” whether it be sales or stars in a review. We should enjoy the writing more than number-watching. That said, it reflects on my integrity if I give a review that is unduly harsh or unworthy praise. If I would have to give one star, I won’t review at all. I rarely give two stars, and then give concrete explanations why the story didn’t work for me. I definitely agree that we should enjoy the writing more than the number watching. For me, deciding how to apply star ratings actually goes back to that integrity issue — and the most important kind of integrity, which is being true to oneself. In my experience, the true long term worth of a book doesn’t really become manifest until months or perhaps even years after I’ve read it. There are some books I didn’t really care for when I read them but stuck with me and wouldn’t let me go. There are others I loved at the time I read them, but I mostly forgot weeks later. When it comes right down to it, if I let most books sit for a time, most of them would probably get 2 or 3 stars if I follow the Goodreads scale literally — “it was ok” and “it was good.” However, that doesn’t really capture my enthusiasm for reading in general. What I was finding was a tendency in myself to think too much about how other people rated books and worry too much about what people would think of me if I rated a book too high or too low. In essence, I wasn’t being true to myself because of these concerns. That said, this subtle difference in approach is unlikely to affect my ratings much. There may be a book here or there that I’d give one more star to or one less star to. Of course, that goes back to another complaint about the five star system — it’s just too coarse! There’s a lot of books I might give 3.5 or 4.5 stars if I could. These are the ones where this enthusiasm issue may come into play more often. Like you, I rarely give one star reviews — I’ll generally let the book go unreviewed if I really disliked it. Oops, David, I forgot to tell you to check this link on my blog out. You might like one of the authors I’ve listed. Thank you for the shoutout. Much appreciated!